13. 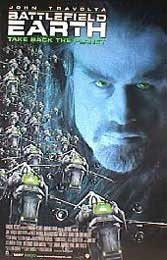 Battlefield Earth (2000) – John Travolta’s two decade long quest to put L. Ron Hubbard’s work on film bombed in a big way. It won seven Razzies, a feat only accomplished by another famous box office bomb “Showgirls” (I am not even going to pick on Showgirls). Budget 73 Million, U.S. Box Office 21 Million. 12. 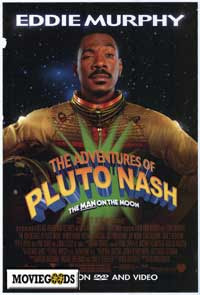 The Adventures of Pluto Nash (2002) – Eddie Murphy really needs to quit! Sometimes he is pure genius, while other times he really needs to chill, have a seat and think about what he is doing. This was one of those times. Budget 100 Million, U.S. Box Office 4.4 Million. 11. 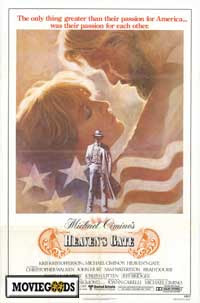 Heaven’s Gate (1980) – Mix cattle rustlers, rich WASP ranch owners and roller skating and you have a recipe for disaster. This film destroyed the career of director Mike Cimino and shut down the United Artist Studio. Budget 40 Million, Box Office 3.5 Million. 10. Town & Country (2001) – Not even Warren Beatty, Diane Keaton, and Goldie Hawn could save this fiasco. Budget 90 Million, U.S. Box Office 6.7 Million. 9. 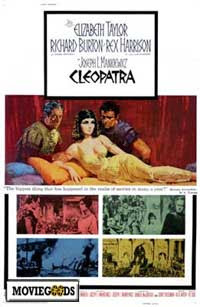 Cleopatra (1963) – While not quite as bad as others film on this list as far as budget goes, it none-the-less lost plenty of moolah. Budget 44 Million, Box Office 26 Million. 8. Hudson Hawk (1991) – Oh Bruce, this surely is no “Die Hard”. Rumor has it that a special effects firm had to go through the film and airbrush his bald spot. Talk about sensitive! A hat would have been a hell of a lot cheaper. Budget 65 Million, U.S. Box Office 17 Million. 7. 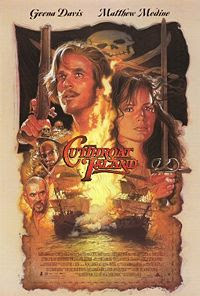 Cutthroat Island (1995) – Director Renny Harlin convinced Carolco Pictures that his then wife Geena Davis could carry this action film. She couldn’t. The film shut down Carolco Studio and derariled Ms. Davis’s career. Budget 98 Million, U.S. Box Office 19 Million. 6. Ishtar (1987) – In spite of good reviews by the New York Times, this film about two lounge singers caught up in the cold war flopped. Budget 55 Million, U.S. Box Office 14 Million. 5. 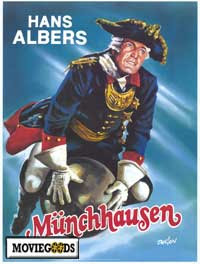 The Adventures of Baron Munchausen (1988) – This film flopped at the box office, but picked up steam on video and DVD. Budget 47 Million, Box Office 8 Million. 4. 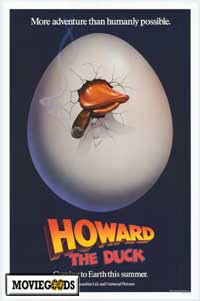 Howard the Duck (1986) – It is hard to believe that George Lucas was affiliated with this foolishness. A cigar smoking duck from Cleveland…As my uncle would say “Like Wow!” Budget 38 Million, U.S. Box Office 16 Million. 3. The Postman (1997) – Believe it or not Kevin Costner’s Waterworld actually made money, but Dirt World (as the crew so lovingly called this one, did not. Budget 80 Million, U.S. Box Office 17.6 Million. 2. ZYZZYZX Road (2005) – This road really exists. It is an exit in California close to the Nevada border. I have passed it numerous times on my way to Lost Wages, Nevada. A lot of indie films don’t make money, but this box office payoff was less than the price of filling up my Toyota Matrix! Budget 2 Million, Box Office 30.00 (Yep! That’s Right! 30 freakin dollars). 1. 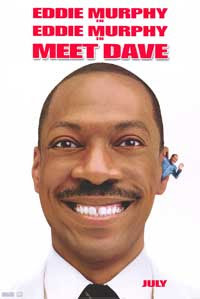 Dave (2008) – Eddie Murphy strikes again. This is the #1 potboiler of the summer with a Budget 60 Million and a U.S. Box Office of 11.6 Million. A couple of surprises on your list, but some of them were, indeed, terrible. The duck movie struck a chord. The others I knew to be terrible. How long until they are cult classics? I've only watched one...The Postman...and I must say, it was DUMB, DUMBER and DUMBEST in my opinion. Welcome back! :) I have to disagree with ... .wait... which one was it... ;) Amazing how many movies Eddie Murphy has bombed! Is that poster for the 1988 version of Munchausen? I thought it starred John Neville, directed by Python Gilliam. I saw Town and Country and was not much impressed, but I don't see how it could have cost that much. It was mainly set indoors, with no special effects or crowd scenes. I suppose most of the cost consisted of overinflated salaries for the stars. Cleopatra was a great film. I know it lost money, but it was a good one! 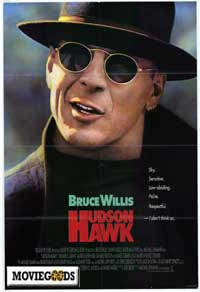 Hudson Hawk was one of my exes' favorite movies. I watched it with her and was surprised that I actually liked it. I had forgotten about the $30 bomb that made #2 on your list. The next time that Katherine Heigl starts popping off to the producers of "Grey's Anatomy", they should show her a poster of "ZYZZYZX Road". I havent seen most of your list...I agree with all the ones Ive seen except The Postman. I liked it:) Happy TT. I actually like some of them on your list. Tee hee. Happy TT. I haven't seen any of them, but I really enjoyed reading through your list! Great TT! Hmm. Warren and Eddie got in on two each. Seems like it's time for them to make a picture together. 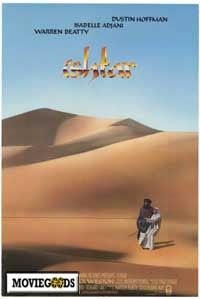 I saw "Ishtar" and "The Postman" at the theater. And, they deserved to flop. Haven't seen the others... some I haven't even HEARD of. LOL on the one that earned $30. I guess there's good reason for my never having seen a single one of these. Fun T-13! Mine's up, too! I'd have to agree with all but a couple of them. We really like "Cleopatra". Happy TT!! Mine is posted and I did 13 Most Beautiful Classic Movie actresses!! OMG - it is movie week, Malcom did Legal Movies, I did 13 Legendary Film Stars that Never won Best Actor and you're doing movie bombs!!! It's so funny, I just recorded Cleopatra with Elizabeth Taylor. I'd never seen it! Probably because it was 4 hours long and at 12 I would never have made it through without causing a ruckus in the theater and embarassing my folks, lol. Anyhoo - holy cow, what a historical piece of crap that was AND the costumes??? Take early sixties fashion and hairstyles and try to make them look Egyptian - since when did the Egyptians have gold lame??? I was laughing near the end and then I was getting ticked off. Burton's portrayal of Marc Antony turned this historical figure into an alcoholic poor-me schlub. Okay, it's said Antony did have a fondness for wine, women and song and his fondness for Cleopatra was so hormonal, but schlubs with a poor me attitude did not make it to the rank of General in Ancient Rome, let alone to co-ruling the Second Triumvirate. Okay, I've vented about the LaLaLand Cleopatra. 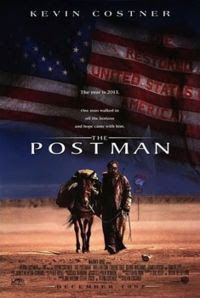 I think Postman failed largly due to Kevin Costner's rapidly receding hair line - though being a bad film didn't help, lol. Now, when you mention "Dave" - be carefu - LOL, "Meet Dave" with Eddie was a dud but "Dave" with Kevin Klein is one of my favorite films to watch over and over and over!!! I think you should add Solaris - costs: $47,000,000 gross: $14,970,038 -even George Clooney couldn't save that one! 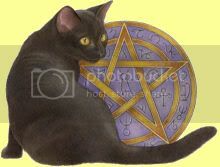 Happy TT to you Ms. Pjazzypar - and sending you some ointment to sooth your bruises from the great blog bully! Oh my goodness, I remember seeing Howard the Duck as a teenager. 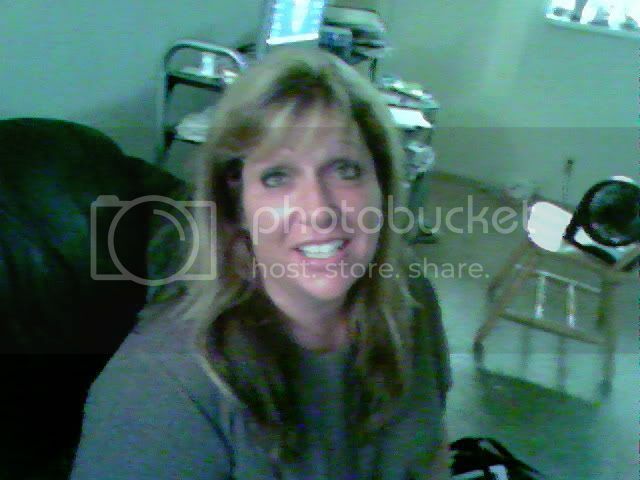 And even then thinking it was bad. lol. The one that only made $30 cracks me up. I'm sure those involved weren't laughing, but $30??? That's so bad, it's funny. From this list I've only seen Cutthroat Island (on TV). Great list! Thanks for visiting my 40th birthday TT. In our site you can compare the prices from high quality shops. You can find full details and description of our Invicta Grand Diver Watches. Here you'll be able to buy the right [url=http://invicta-grand-diver.pkak.com/] Invicta Grand Diver watches[/url] that fits your needs and budget, and most important, those you wish to have.